Sometimes all you need to get going is a little inspiration. 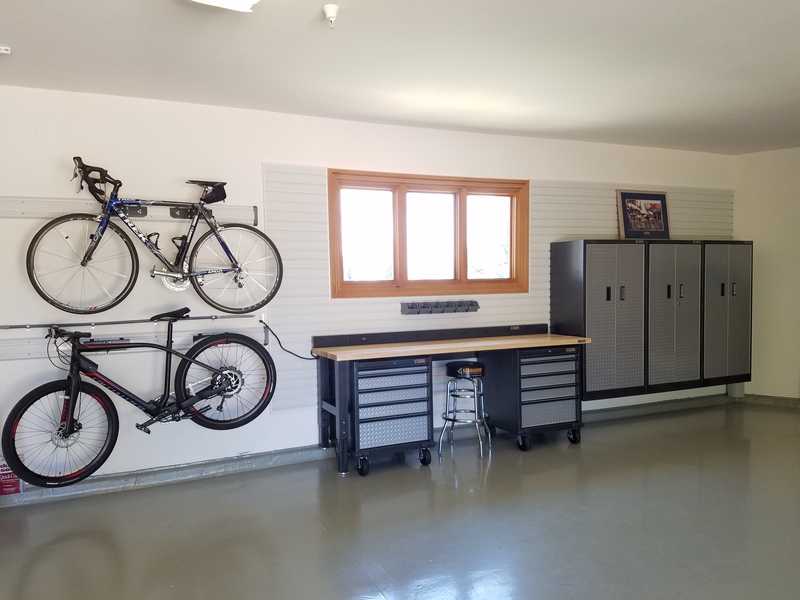 I thought it might help to share some stories to help give you some of your own garage storage ideas. The key to an organized space is having the right storage configuration to fit your unique needs. Doesn’t it just make sense that if you have a place for everything, everything can be in its place? 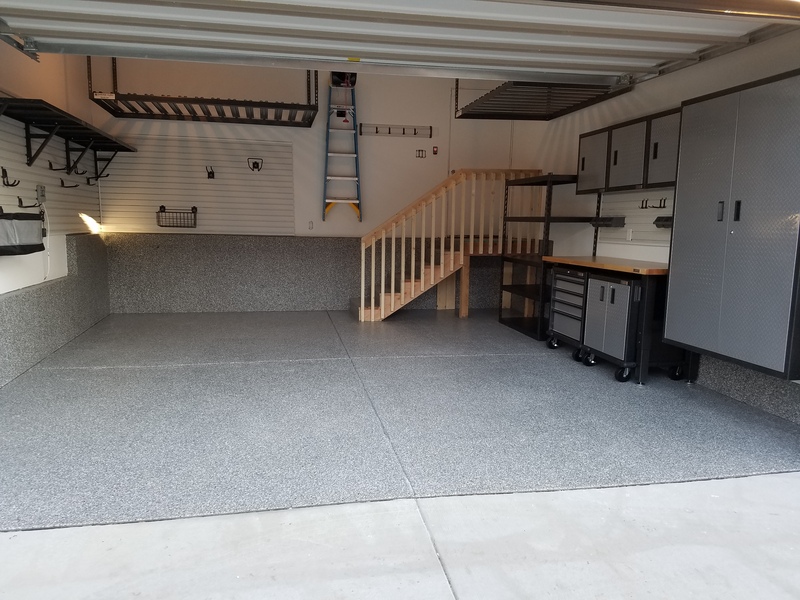 So take a look below, and when you’re ready to get started on your garage makeover, give me a holler. 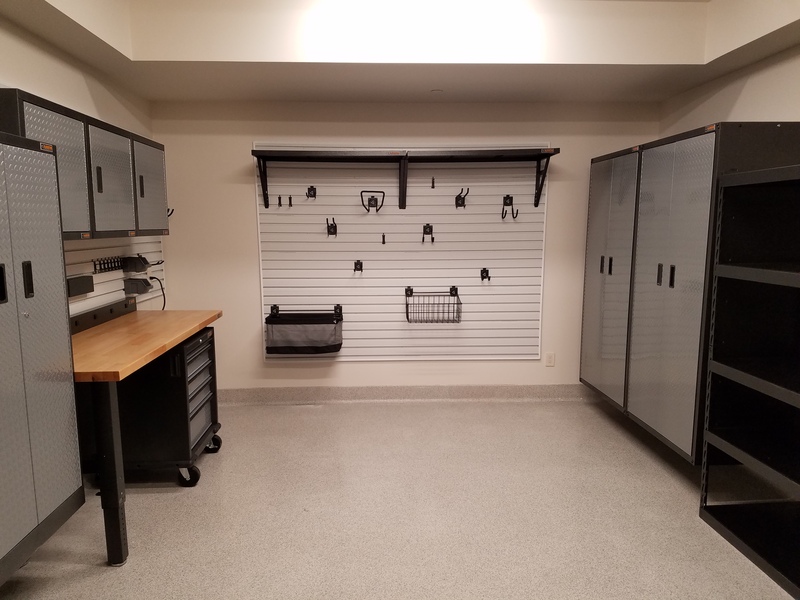 When these homeowners moved from NYC to Denver, they brought industrial shelves that had line the walls of their basement storage unit, thinking they would suit just fine in their 20’ x 20’ 2-car garage. I advised it would be difficult to fit two cars in the garage if they did that. They agreed it would be tight, but hating the waste, they opted to try and use what they had. 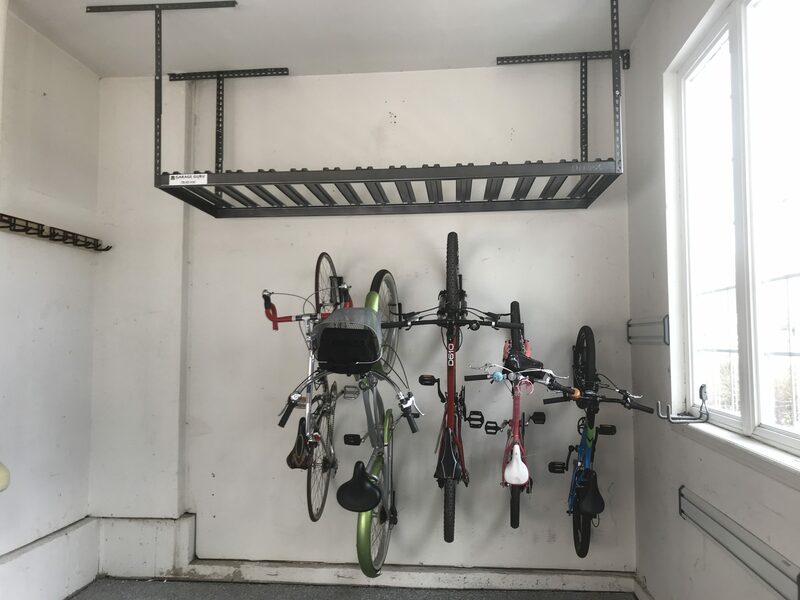 I installed an overhead rack to help them get the stuff that wouldn’t fit on their shelves off the floor and out of the way. I knew that wouldn’t be the last I’d hear of them, so I settled in to wait. One year later, I got a call. They were tired of having to squeeze in and out of their cars, and they wanted easier access to the stuff on their shelves. 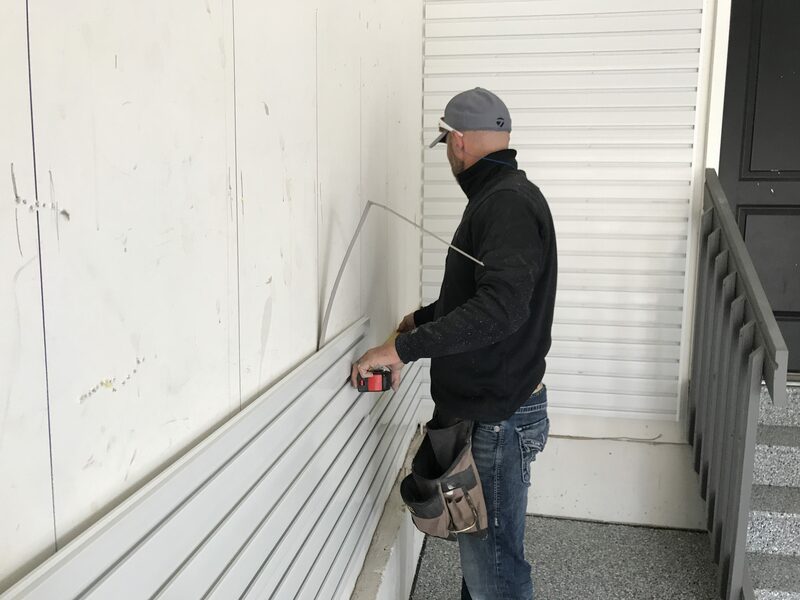 We started with slats on the front wall, which will hold hooks and baskets and shelves that they can move around as their needs change. It also covers up the exposed studs, making for a neater overall look. 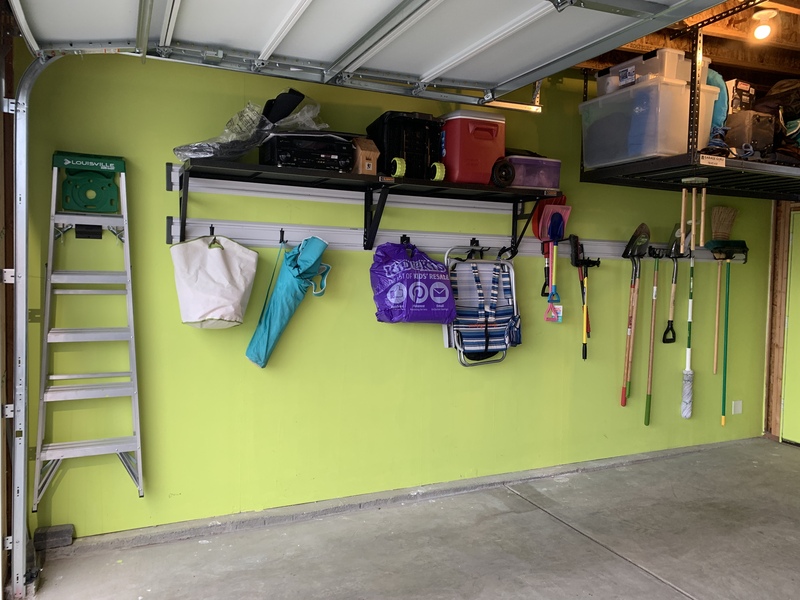 The wife got really excited about the slat wall, because (as she noted) it had both form and function: not only did it look nice, but it would also give them maximum utility and flexibility to reach the stuff they use regularly and change up the configuration as often as needed. We also installed two cabinets on the front wall, to hold all their gear and supplies, and keep the clutter behind closed doors. 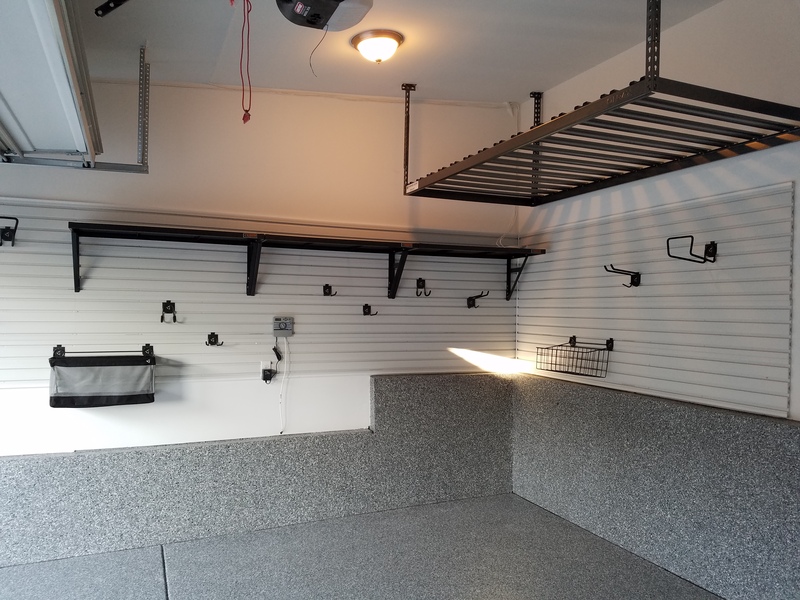 And we installed shelves all along the side walls, up nice and high so car doors could open wide enough, with tracks to hold yard tools and whatnot without taking up too much space. 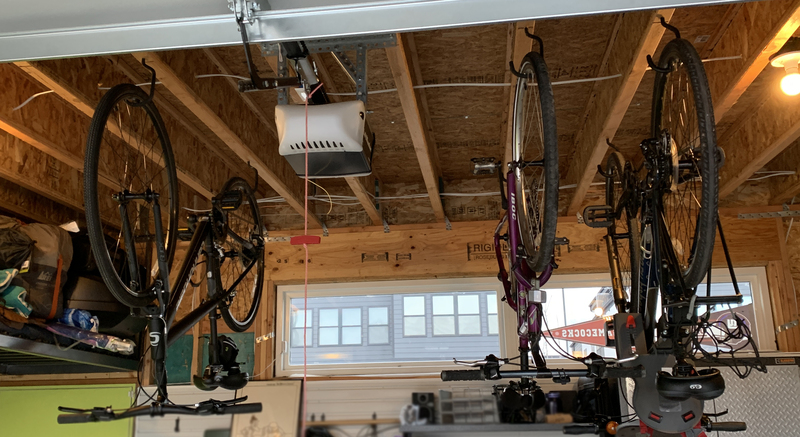 Their three bikes we hung from the ceiling studs—easy to access even with cars in the garage. We made maximum use of their entire space. 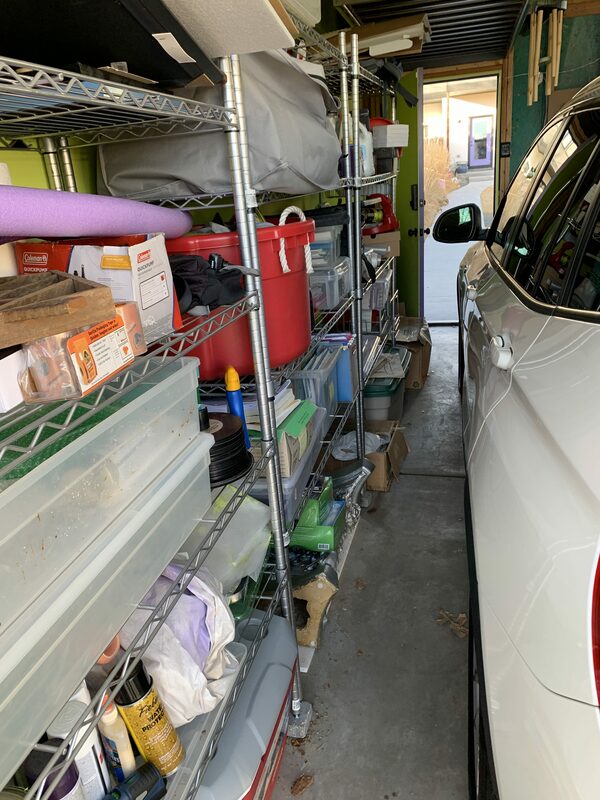 They were able to store everything they wanted in their 20’ x 20’ 2-car garage, including both cars, with enough room to comfortably ease in and out of every single time. The key to an organized space is having the right storage configuration to fit your unique needs. Doesn’t it just make sense that if you have a place for everything, everything can be in its place? Schedule your free 1-Hour Consultation now! The homeowners had cleared out their garage, and they wanted to keep everything off the ground and clean. With a few kids plus the parents, this family had a lot of toys: Bikes, scooters, sport equipment, golf clubs, etc. They also needed a place to keep their yard tools and chemicals. And they wanted a space to work on ad hoc projects. With a 3.5 car garage, we had plenty of space to work with. The first day, we finished the floors: we applied a polyurea concrete floor coating. 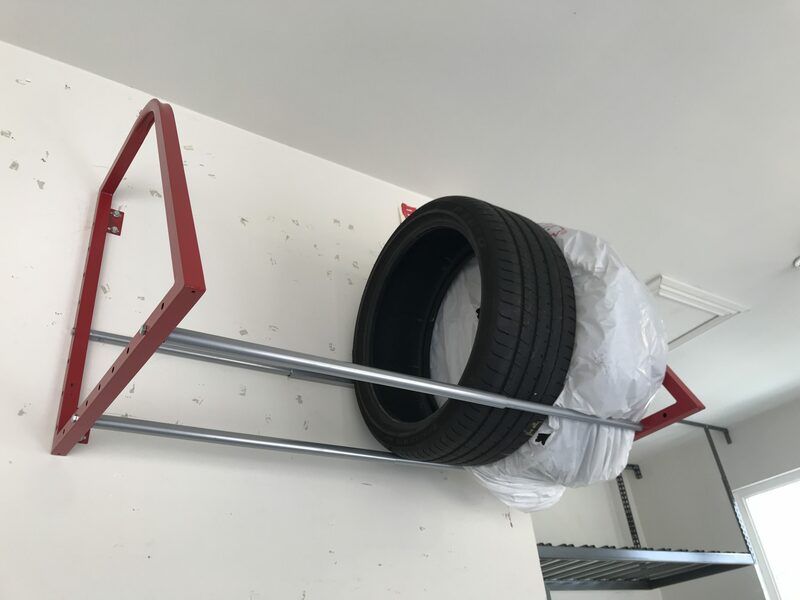 This is an essential first step in keeping the garage clean. Dust and dirt collect and multiply on unfinished floors, so that’s why we typically recommend finishing them. 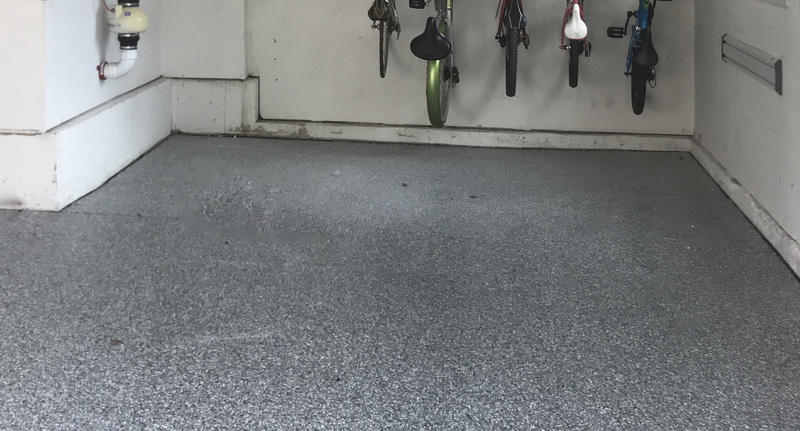 If a clean garage is a goal, finished floors are a must. To keep everything off the ground, we focused on the walls and the ceilings: Overhead storage. Tire rack mounted out of the way. The cargo box hanging high above the car, ready to be lowered at a moment’s notice. Bicycles on the wall, easily accessible, with space-saving rotating hooks. Slat walls to hold hooks and baskets. Tracks for yard tools. 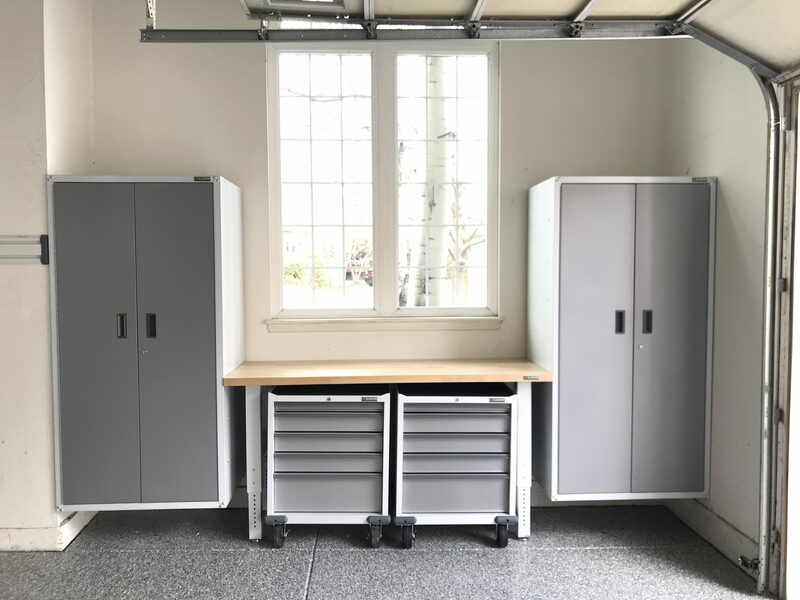 To keep things uncluttered, we installed some cabinets with doors and ample storage space for all their chemicals, and a work bench with under-table drawer chests on casters to store their workshop tools. 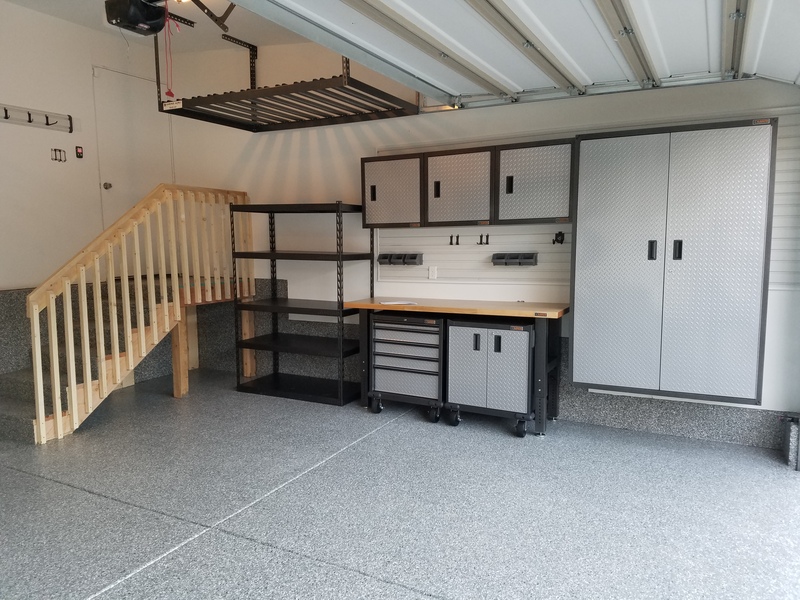 This homeowner had a small garage and just wanted it to look nice. 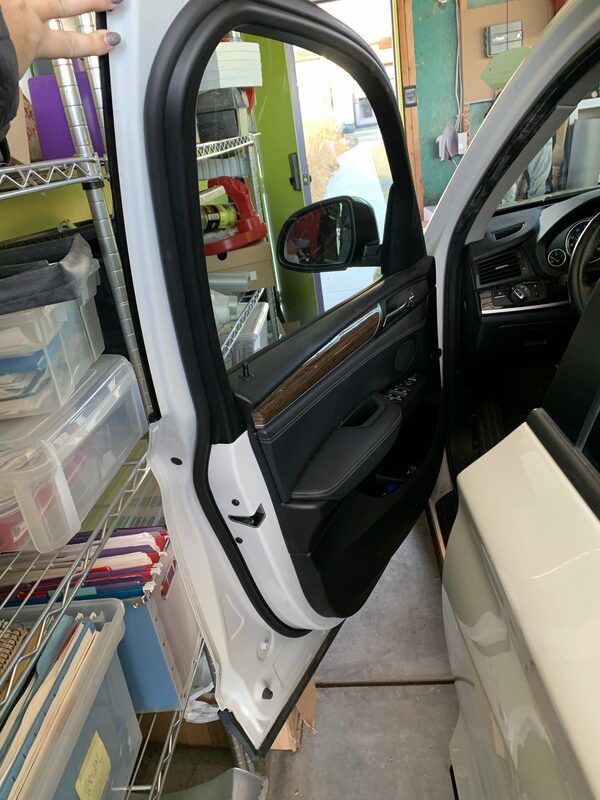 He didn’t need any storage, and just wanted some paneling installed along the sides like a wainscoting, so the car door wouldn’t hit the wall. This guy was meticulous: I think he washed his car something like every other day. The solution was simple: a slat wall. 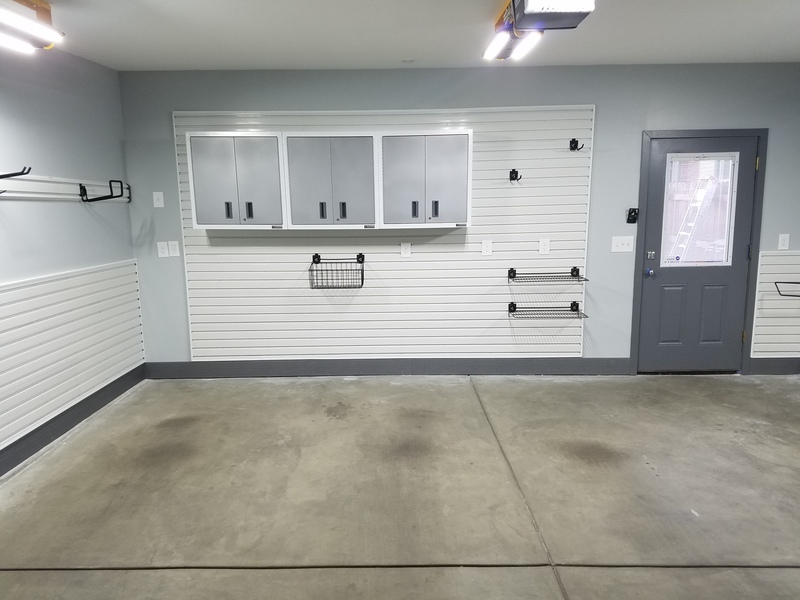 I’m choosing to highlight this garage because I enjoyed the installation right from the start. For one, the homeowners were a couple of really cool people. But the main reason is, I knew I could deliver a great product and they would appreciate my workmanship and attention to detail. When I install a slat wall, I make sure everything matches up: I install the screws in straight lines. I make sure the seams are nice and tight. I knew I could impress this extremely meticulous homeowner, because I’m just as meticulous as he is. My only regret is not getting him to finish the floor. That would have matched really well with his slat walls, and it would have kept his garage a lot cleaner. Maybe he wouldn’t have to wash his car as often! These folks were collectors, and as such, they wanted their garage to feel like a functional museum: to display their beautiful cars, photographs, racing collectibles and car decals. They also owned a few famous artifact bicycles they wanted to feature on the walls. Keeping that garage pristine was top of the list of needs. The floors were already finished, so we focused on storage options and walls. We installed cabinets, a big workbench and some tool storage to keep everything behind closed doors or inside drawers. We left their walls clear for their art, and hung their bicycle artifacts like art installations, true to museum form. A note on the floor: While a clear coat over the concrete is beautiful, it’s not practical and I don’t typically recommend this for the simple fact that it lacks texture and is therefore as slippery as an ice-skating rink with any wetness or just a little bit of dust. In fact, the dust is worse than wetness! The chips on a polyurea floor serve a purpose: they hide dirt, but most importantly, they are anti-slip. 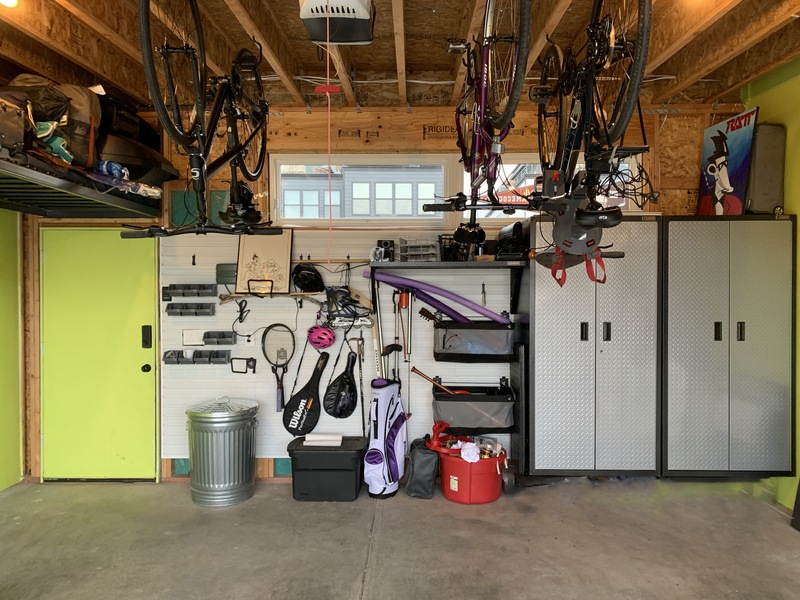 These homeowners wanted to keep their garage clear for their cars and bikes, and to turn their unfinished basement space into a place for winter sports gear and a workshop. 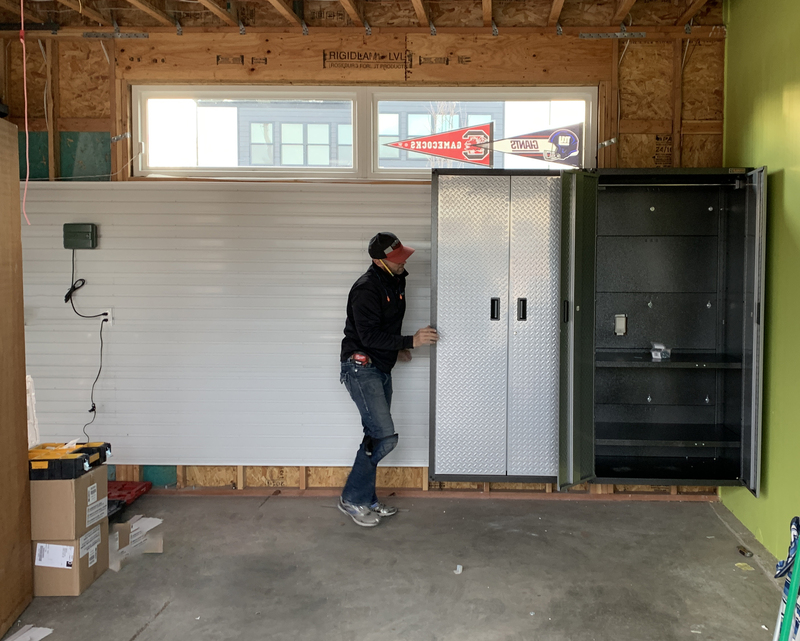 We installed a gear closets for their skis, coats and other associated gear. A closet to store all their tools. And a workbench to fiddle and tinker whenever the urge struck. This was a fun project. The place was amazing, a gorgeous home on top of Vail, but most of all, I enjoyed turning an empty space into a highly functional one for this very nice, very down to earth couple. This garage was brand new, as was the house. 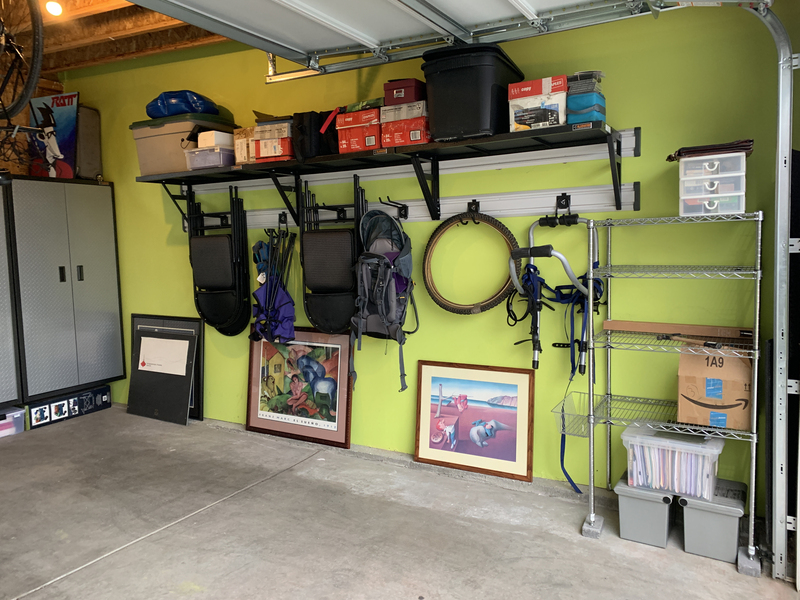 Lucky for me, the garage was completely empty—a blank slate. This guy had a lot of stuff to store and display: He wanted form and function. A hunter and a keg distributor, this guy had a lot of stuff to store, and at 19’ x 19’ with a stair to the house awkwardly placed, his garage wasn’t huge. Still, he wanted some space to tinker and work, and we were up for the challenge. The stairs took up a lot of space in the front, and he knew he wouldn’t be able to get 2 cars in there even if he wanted. So, we left space for one car and worked with the rest. 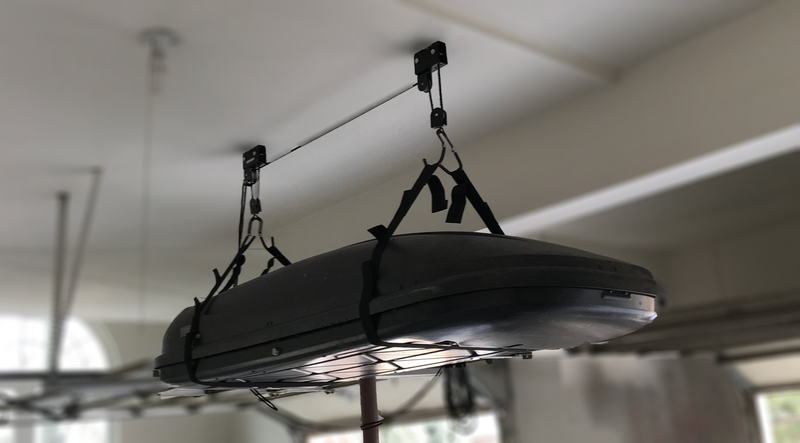 Luckily, he had tall ceilings so we could put some overhead racks, which helped with the bulky gear like car carriers and hunting totes. He’s also a tool guy, and had quite a collection, so we turned the space in front of the stairs into his workshop. In the end, we made the most of the space he had, and thankfully he was pretty happy with it. All’s well that ends well. Keep checking back for more garage makeovers!